This may sound stupid, but the first thing we did after finally getting our despacho was fall asleep, but we had an hour to leave the harbor and we were the first boat out of three that was planning on taking the same window to get cleared out so we had a few minutes. Between my climbing fever and the bureaucracy stress we just needed a moment to regroup before starting out on what ended up being a long trip. 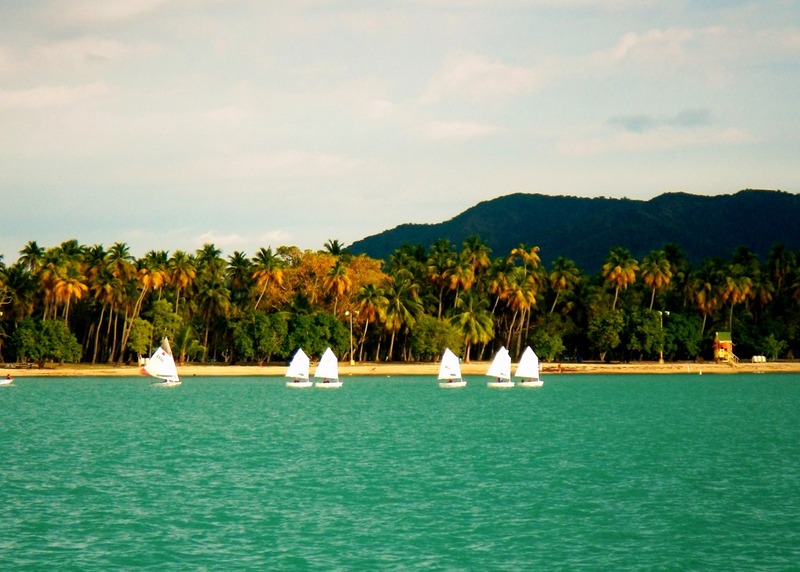 We left that afternoon, sailed through the night, sailed all the next day, sailed through the next night, and sailed through the next day until pulling into Boquerón Puerto Rico in the early evening. The autopilot functioned for about one hour of that whole trip before breaking. Having to hand steer made the trip seem to take foreeeeevvvveeeerrrrr!!! The conditions weren’t bad, actually quite good, but parts still felt something like having strapped your home onto the back of a galloping horse. Keith took the majority of the watches and we disregarded a set watch schedule. When ever one of us naturally woke up from a nap, we took over. Most of my watches were short, an hour or two. It was all either of us could do feeling so crappy. All I wanted was to climb under a mountain of blankets and not come back out. As we passed near Samana Bay we kept a look out for whales. This time of year humpback whales migrate and gather in the shallow waters off of the coast of DR and the mothers birth their calves here. I really didn’t want to spot any. Our boat insurance covers pretty much everything a normal policy covers except it has one very clear exclusion- damage by marine life (whales). We figure there is good reason. At first all we saw were fishing nets, in fact we found ourselves surrounded by a large drift net near Samana. We had to cut the engine and float over it because we couldn’t see either edge of it. Then we heard Antares shout on the VHF- WHALES!!!!! Off our starboard bow, probably close to a mile away, we saw them. At first we thought we saw the whole whale breaching then realized it was only its tail. That is when I really realized how massive they are! We watched as the whales would lift their huge tails out and slap the surface causing a huge splash. We also saw them spouting and even a few breaches. My favorite was watching them roll over-and they did it over and over again. One gigantic fin would slowly lift out of the water, arc, and splash down thunderously just as the second gigantic fin would lift out and follow. They put on a non-stop show for about half an hour. 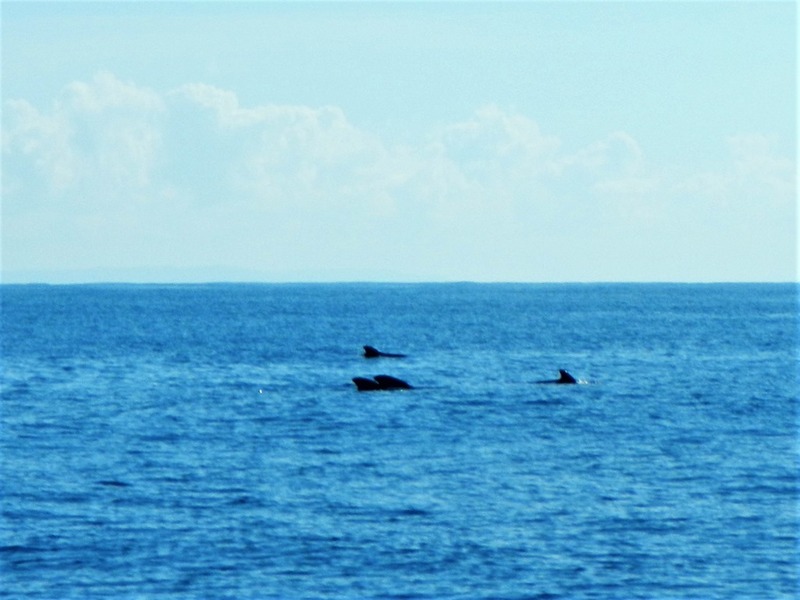 I hadn’t wanted to see them from our boat but it ended up being one of the most amazing experiences. There we were sitting in our cockpit, in our pajamas, watching a few of only 15000 great humpback whales in the whole world frolic in front of us. MAGNIFICENT!!!! I didn’t get photos, my camera doesn’t have a good zoom so all that would have come out is a lot of water and sky and a tiny splash. Instead we just took in the moment. We didn’t go any closer to them, they were longer and heftier than our boat and they were tossing there massive bodies about like a tantruming child, we stayed well out of their way!!! It was an absolutely spectacular experience. The second night of sailing was long and a little bouncy, but completely uneventful as we finally pulled away from the coast of the DR. 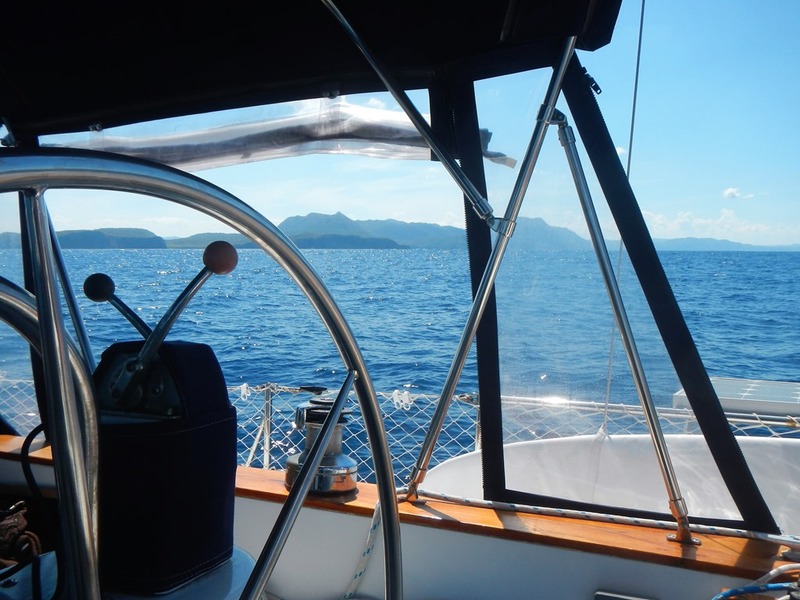 The morning found us at the edge of the Hourglass Shoals and the beginning of the Mona Passage. I could write a paragraph or more on the hows and whys the Mona Passage can be one of the most treacherous passages in the Atlantic. But we have had enough drama the past week so I will just write that it was flat calm-totally mellow. Of course, that is specifically why we were so determined to make our weather window out of Luperon on time. The Mona did bring her own surprises though- more whales!!! At first Keith thought he saw a big log in the water but it was too black and shiny. When he realized it was a whale, he thought it was a baby humpback and started looking for mama! It was a pilot whale (we think). We passed within 20 feet!!! I was down below and didn’t make it up in time to see it, but it wasn’t my only chance. 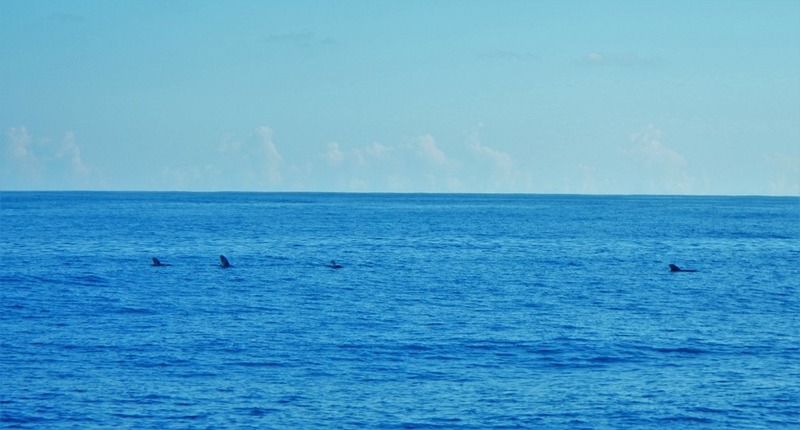 From there on, through the whole Mona Passage, we passed pods of them. These ones were smaller than the boat and were just floating at the surface- not tossing their heft about like the giant humpbacks. We still didn’t get closer on purpose. It ended up being a great Mona Passage crossing. We are becoming great believers in being very selective of weather windows! By late afternoon we had pulled into Boqueron, Puerto Rico and dropped hook in the company of our passage-making friends Antares and Blabber. To clear in Customs we needed to make a phone call which would have entailed launching the dinghy and putting the outboard motor on it- they were both secured away for for the trip. Instead we raised the Q-flag and were both asleep before dark. In the morning we learned Antares and Blabber were going to take advantage of the favorable weather and keep going, they have already seen Puerto Rico. We have not and we need to take care of some details like repairing our autopilot and getting some mail shipped in from the the US so we said our “until we see you agains” over coffee aboard Blabber. Then we went ashore and called Customs. We had the bought the Customs sticker and signed up for the Small Vessel Reporting Program in the States so we expected to just have to make a phone call like when we cleared into Florida from the Bahamas. That is what all the other US vessels seemed to do when they got here. Instead we were told that someone would be out to the boat for an inspection within a few hours-just wait on the boat. That was fine we needed some more time to relax and recover anyway. We went back to the boat and waited. And waited. By 4:00 we got impatient and Keith went in and called again but there was no answer anywhere. No one ever came out to our boat. There was a concert going on on the beach in front of the anchorage at night. We got to enjoy it from the cockpit but the smells of fried and sweet vendor food also floated our way. If we had been free to, we would have gone ashore and joined in. But we were not free to go. Again. Seems to be our story lately! ← No Dispacho, No Dispacho, Si Dispacho!!! Hope you are feeling better. Close up whale watching is on my bucket list. Feeling better-thanks! Yes, I want to see them closer up now too…..just not on MY boat!! I didn’t think it would be such a powerful experience. Truly amazing! Hoping you made it to the Virgins have not heard from you guys in a while.